On so many nights, when Ken Ramler of Sartell prepares to go to sleep, he thinks of playing pickleball first thing in the morning and the thought always energizes him with happiness. 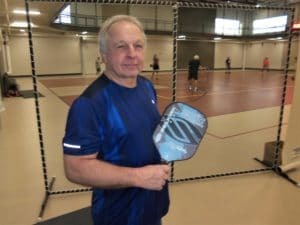 At age 69, he’s played pickleball for five years and loves the game because, as he put it, it’s not only good exercise but a fun social time. Ramler plays at the Sartell Community Center three days a week. He also plays now and then at Whitney Senior Center in St. Cloud, which is where he first became aware of the game. He’s played pickleball on courts as far away as Texas and Hawaii. About fives years ago, Ramler and a couple friends visited Whitney Center and quickly noticed how welcoming the pickleball players were to them. “We tried the game, and we thought, yes, we can do this,” Ramler recalled. From those early games, Ramler became “hooked” on it. Ramler is one of about 100 players who enjoys the game on the six courts in the Sartell Community Center. They are people from all over the greater St. Cloud area, and beyond. Each of the three gymnasiums there has enough space for two pickleball courts – six in all. And that means on most mornings, a total of 24 people are playing at the same time, and more sit and wait for their turns to play. Sartell also has six pickleball courts in Val Smith Park created from the previous tennis courts, with another one planned for the refurbished Watab Park. Some people still do not know what pickleball is or why a game has a name with “pickle” in it. Pickleball is a game played with a paddle racket and a waffle-type ball, and it combines elements of badminton, tennis and table tennis. It is not as demanding or exhausting as tennis. Each game involves four players, two on each side of the net. The first team to make 11 points wins, as long as they lead at that point by at least two points. Pickleball was first played in 1965 on Bainbridge Island in Puget Sound near Seattle. It was “invented” at the home of former Washington State Rep. Joel Pritchard who was elected to the U.S. House of Representatives and later became lieutenant governor for Washington. One day, Pritchard and two friends returned home from golfing to discover their families rather bored that day. They suggested they all play badminton, but they could not find the shuttlecock needed to play it, so they decided to make do with a waffle ball. They lowered the volleyball net and made plywood paddles on the spur of the moment from scraps of wood in an outdoor shed. According to Pritchard’s wife, the game was named after a “pickle boat,” which is the last boat to return from sea with its daily catch of seafood. The men who rowed the pickle boat were chosen from the leftovers of other boats. For some reason, Pritchard’s wife said the improvisatory nature of the game reminded her of the last-minute pickle boats and thus the name stuck to the game. Ramler said pickleball is popular because people are discovering the game does not take tremendous skill to play – in other words anyone of any age can enjoy the game for fun exercise. Furthermore, although the action can be strenuous and competitive, a relaxed camaraderie among players is the mood of every game, not who wins or who loses. Many senior citizens, including lots of women, love the game. An average game lasts about 15 minutes. And after each game, the players at Sartell Community Center love to “mix it up” a bit, with players going to other courts there to choose different teammates and compete with other players. Ramler and his wife, Nancy, go to Texas for a couple of weeks in the winter. He likes to play pickleball there. Some of the players limp a bit with bad knees, some are overweight and one had a knee replacement about a year ago. Their ailments didn’t stop them; they gathered at the pickleball courts and had a lot of fun, Ramler noted. Ramler has been a professional woodcarver for many years and made a good living from it, making art objects such as birds, relief carvings, little whimsical houses and so forth. He also teachers wood-carving and – not surprisingly – pickleball classes. On Monday morning, Dec. 10, the six courts at the Sartell Community Center were a flurry of pickleball players slamming the ball back and forth over the nets. Players, while getting quite a vigorous workout, still looked relaxed with lots of comments and wisecracks flying across the net, along with the pickleball. Several of the players, on break, took time to talk with the Newsleader. One of them, Jerome Heiser, hails from Watertown, S.D. On the courts that day were players from Sartell, of course, but also people from St. Joseph, Waite Park, Sauk Rapids and even a few out-of-staters, like Heiser, and someone visiting from Florida. Ralph Schroder of St. Joseph said he loves the game because it makes for a social mixing, playing with lots of other people. Like many others, Schroder learned the game while snowbirding down in Texas. 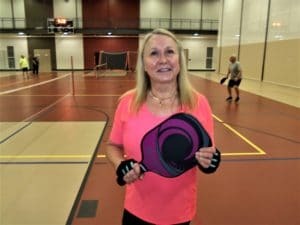 Cindy Wyatt of Sartell has been a pickleball fan for five years after learning it in Sun City, Ariz., her first year as a snowbird. The pickleball courts at the Sartell Community Center are usually open and ready for play almost every day of the week until about 11 a.m. People who want to play or want to learn should just show up. Anyone with a yen to learn it can observe the game being played and then find out more about learning how to play it. Good days to show up are Mondays and Wednesday mornings. Camaraderie among pickleball players is personified during their ritual touching of the rackets, a form of “shaking hands.” From left to right are Karen Nyberg of St. Cloud, Noel Blais of Sartell, Sharon Madson of St. Cloud and Jerome Heiser of Watertown, S.D. 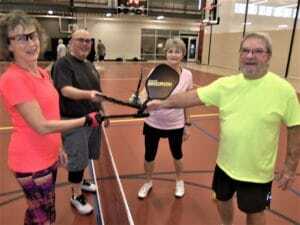 They were among the many pickleball players Dec. 10 at the Sartell Community Center. Noel Blaise (right) and Karen Nyberg get ready for the ball to be served by their opponents across the net. Cindy Wyatt of Sartell first played pickeball five years ago during her first “snowbird” trip to Texas with husband, Todd. 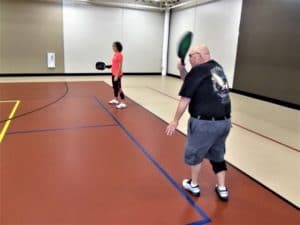 Ralph Schroeder of St. Joseph enjoys the mix-it-up aspect of pickleball — the way players don’t stick together as a clique but, rather, change team mates and opponents quite often on a pickleball court, such as this one in the Sartell Community Center.